Developments in science and medicine frequently produce news headlines which create high public awareness of these events. It has been reported that more than one million scientific research papers are published in scientific journals every year.In order to decide which research results should be published in medical or scientific journals to help assure that only the best scientific information is disseminated, there is a system in place called peer review or ‘refereeing’ that is used. Peer review involves subjecting the author’s article on the research to the scrutiny of others who are experts in the same field to ‘referee’ the contents of the article. 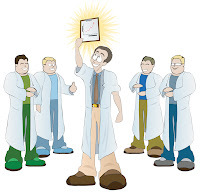 Qualified scientific experts (peers) chosen are required to perform impartial review before the results are made public. While this process is extensively used and universally recognized by scientists as a means to validate research claims, the public knows little about the existence of the peer-review process or what it involves.When you read about results of clinical studies in the various media, be sure that the information has been published in a peer review or ‘refereed’ journal. That way you will know that the research was conducted in a scientific manner and that the results were validated by independent review. HairMax LaserComb(R) Laser Phototherapy Device in the Treatment of Male Androgenetic Alopecia: A Randomized, Double-Blind, Sham Device-Controlled, Multicentre Trial.